Coke bottles of gas, unrefrigerated meat), or plant a garden there. I especially love the garden thing. 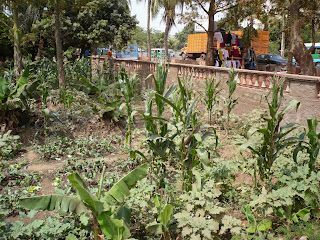 You can be on the road in the middle of Bamako in the midst of absolute chaos—traffic, fumes, dust, 4-story buildings hugging the road, crowds of people stomping around everywhere—and in a 2” crack along the road someone planted a row of corn. bloody fish for sale that are covered with flies that moments before had landed on a big pile of donkey poo. Come to think of it, there actually was a vendor with a pile of fly-covered fish adjacent to the row of corn I spoke of earlier. 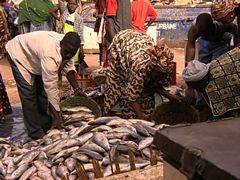 But thank goodness those shiny green stalks glistening in the Malian sun have left a more indelible mark on my mind than the poo fish. Now I’ve always had a thing for gardening anyway. 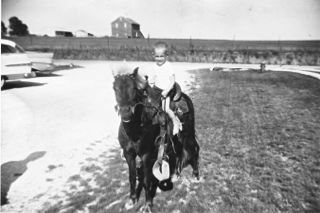 Both sets of grandparents lived on farms for a good part of their lives and had bountiful gardens that I just loved to frolic in (hmmmm, maybe that explains all those odd rashes I had as a young boy). I can picture myself in tiny Mendon, Illinois with Grandpa Fessler showing me how to carefully pick the fat red strawberries off the plants, or how to gently dig into the soil to find potatoes, which was way better than searching for Easter eggs. French fries or mashed potatoes as an end product trumps a stupid plastic egg any day of the week. Yay for saturated fat! 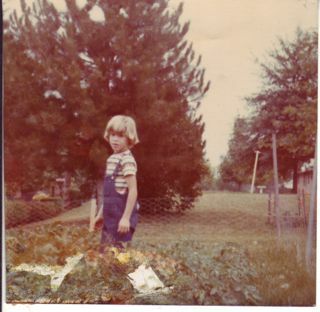 I can remember Grandma McClelland’s lush garden in even tinier Meyer, Illinois. Between gardening and making pies and having the Mississippi River a block away, spending a week up there was the ultimate. The best part was that raspberry vines covered the rusty metal fence that bordered one edge of her garden, and we would pick a bucketful and go right inside and make raspberry pies. Sweet berries, butter, sugar, and dough, and then some more butter smeared on top, and then some more sugar sprinkled on that. Eaten with ice cream of course. And washed down with a Frosty root beer. I was on such a sugar high I could have detassled all the corn in a 50-mile radius of her house. grapes into my mouth than into the bucket. Eat ‘em now, or eat ‘em later, what was the difference I reasoned. We always had tomatoes growing in the summer, and although we didn’t always grow sweet corn I somehow made it magically appear on the kitchen table on many days. Okay, so I picked it from the farmer’s field next to our cul-de-sac (yes, I learned French at an early age). I just figured it was payback for all the times he sprayed his fields with DDT or Agent Orange or whatever, and it drifted into our house where we breathed it in deeply and probably blacked out. I just can’t remember clearly. save for the spindly palm trees that would ultimately line the rows of parking, providing no shade and dropping giant fronds on cars. 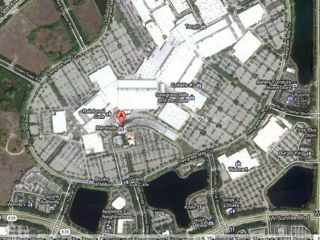 The shopping centers and mini-mansion developments we designed for our clients destroyed every pine grove and shady marsh in sight. Then we named these shopping centers and housing developments “The Shoppes at Pine Grove” or “The Villas at Shady Marsh.” Stewards of the land, that’s what they called us. such as rice, corn, sorghum, and the most vibrant lime green lettuce. 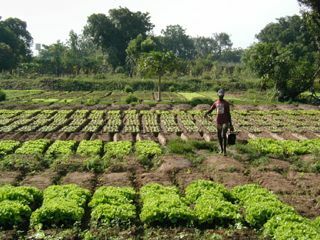 Men and women are working these fields when we are on our way to school at 6:30 AM, at high noon when I glance out of the 2nd story window of our chilly library, and when we are driving home at 3:30 PM (15:30 if I’m trying to sound like a local). No wide brimmed hats, no Banana Boat SPF 50 sweat-proof sunscreen, no breaks to enjoy an icy Coke and a bag of barbecue Fritos. And “working these fields” does not involve any equipment invented since medieval times. They use nothing but handmade tools that you would see the peasants using around King Arthur’s castle, all of them short handled and requiring one to bend over to use. That’s a weird thing here. I know for sure that shovels and hoes and rakes with long handles have been invented, but not one of those things is in sight. Even the custodian who cleans my classroom uses a broom that’s a bundle of course hay-looking stuff tied to a 6” wooden handle that requires him to bend over to sweep, just like Cinderella or the witch in Hansel and Gretel. Every time I see him use that I picture my broom back in Florida with its own jingle touting the merits of its long shiny handle (“O-Cedar makes your life easier”). Of course within 30 seconds his fairy tale stage prop broom has stirred up a Saharan-style dust storm and I run from my classroom gasping for air. I mean, it can’t cost too much more for 3 feet more of wooden handle, can it? 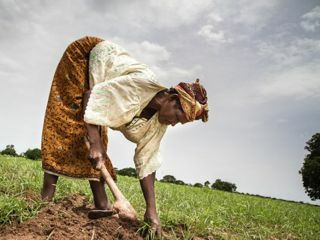 I really want to run out into those fields with a branch I broke off a tree, lash their tiny handled shovel or rake to it, and show them how to avoid back problems in later life. For the work they do, a long handled tool would be heavenly. 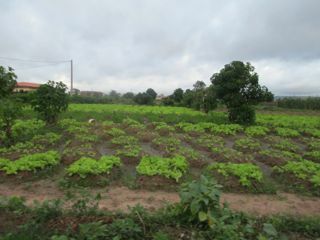 Because it’s the rainy season now, all of the fields they plant are done in raised-bed style. That means they manipulate the soil to create a patchwork of raised rectangles, maybe 3 feet by 2 feet, with channels in between that carry away the massive amounts of rain. If it doesn’t rain, which it hasn’t done in the past week or so, they fill a watering can (another fairy tale stage prop-looking device) from the well in their field (also known as a very deep hole they dug not surrounded by any type of fence or rock wall that would prevent one from falling down there) and hand water every square centimeter of their field, one can at a time. That’s a lot of backbreaking work that makes me appreciate every bite of carrot or piece of lettuce I chomp down on here. And speaking of eating the produce here, it is absolutely the tastiest stuff ever. Our maid Fati makes our dinner from the loads of fresh vegetables and fruits she buys for us every week. The potatoes are more flavorful, the carrots sweeter, the bananas don’t cause heartburn, and there is this sweet potato-ish root vegetable that makes fries that I dream about at night. However, before you eat any vegetables or fruit here you have to follow a little routine. You fill the sink with water and add 2 capfuls of “eau du javel” which I thought had such an attractive French name but really just means “bleach.” You soak the produce for 30 minutes or more, give everything a good rinse, and then you’re good to go. Unless you want surprise explosive diarrhea (which is the topic for another blog post) this is a step you don’t skip. Apparently the well water they use to irrigate their fields here isn’t exactly like the bubbly fresh underground springs that Perrier uses for its water. A drop of Bamako well water under a microscope would reveal a full-on bacteria jamboree. And the soil could also contain various types of poo, which I won’t detail here. 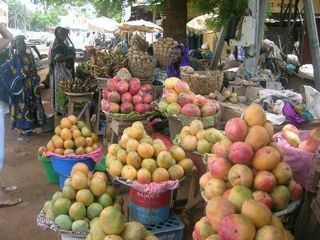 Of course there are none of these worries in the States because produce there is coated with pesticides and herbicides and might involve genetic mutations and all of that that makes it much, much healthier. 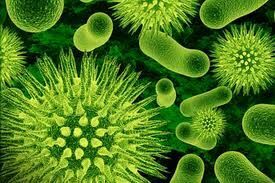 On a side note, I read that scientists have discovered that we have several handfuls of bacteria, fungi and other microbes in our body which compose up to 3 percent of our body mass. So if you’re a 200-pound person, up to six pounds of you is actually bacteria and such. One more reason I use plenty of eau de javel. 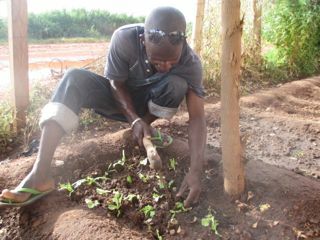 Now this is the time when I slip in the fact that we have our own gardener, Oumar, a young Malian who also works part time for our school’s director. 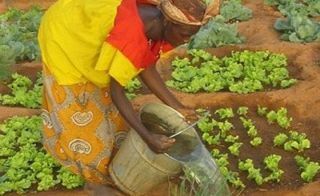 Not that I don’t enjoy personally getting my hands dirty or sweating as I plant things, but when someone will do the sweating for you for just $50/month, my direct involvement lessens. And Oumar does all of this manual labor while maintaining a very hip and stylish exterior–mirrored Aviators, cuffed jeans, casual flip flops. He always looks like a Gap ad. If I was digging in dirt in the African heat I would look like an ad for Hillbilly Handfishin’. 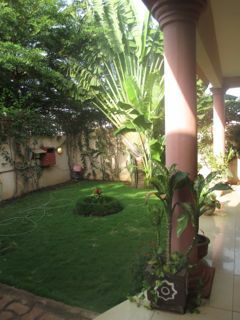 While looking natty, Oumar has lined our wide porch as well as our rooftop deck with clay pots of hibiscus, bromeliads, ginger, and other plants we had back in Florida. 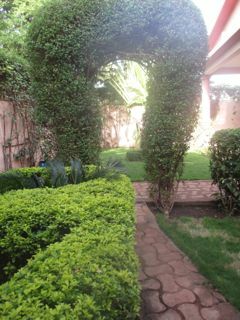 The skinny space next to our house where Oumar is creating the Garden of Eden, sans magical talking snake. 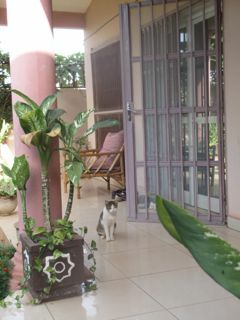 The front porch and one of our guard cats. He’s maintained our compact front lawn as a soft carpet of deep green grass that could be a putting green (if we knew which end of the golf club went up or down). He somehow found and transported on his moto two 5 ft. tall dracaenas in heavy clay pots that we now have in our living room. And he is especially proud of the topiary-like work he does on an arch in our yard made entirely of a shrub, which makes us feel like we are making a grand entrance from the carport to our front porch each day. If he sprinkled the walk with rose petals my life would be complete. The ocra, our least favorite vegetable in the world, grows the best. Our little patch of heaven–and just on the other side of the wall sheep and donkeys and an occasional child use the road as a bathroom. packets of vegetable and fruit seeds that we brought with us. 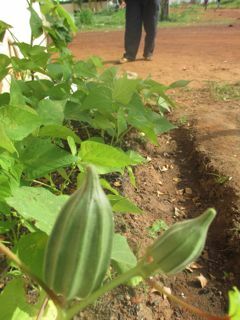 Oumar was ecstatic when he saw these and immediately set about digging and hoeing and raking—using tiny-handled tools. 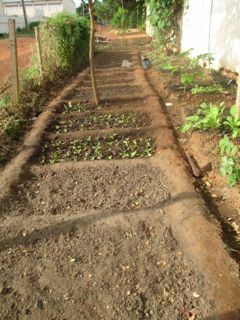 He made more than 20 raised beds in this space where you couldn’t even park a car or a donkey cart. We aren’t exactly sure what he planted—definitely some lettuce, okra too I think, corn (or a weed that looks like corn), watermelon–but it looks fantastic and sometimes that’s all I care about. 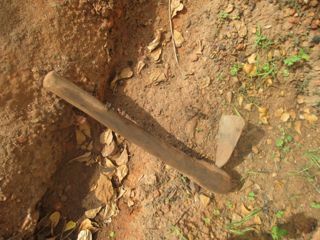 One of Oumar’s gardening tools, probably not made by Black & Decker. 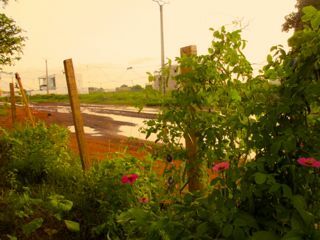 The romanticized view from our garden to the muddy potholed road. The topiary arch that we march through triumphantly each day. the envy of the neighborhood, and I can’t wait to chow down on our first harvest. He is, however, very much like a teenage child who has realized his parents have money: Can I have $10 to buy more compost? I can buy more flowers and pots for another $20. Can I get $40 for a little lawn mower—it will look so much better. 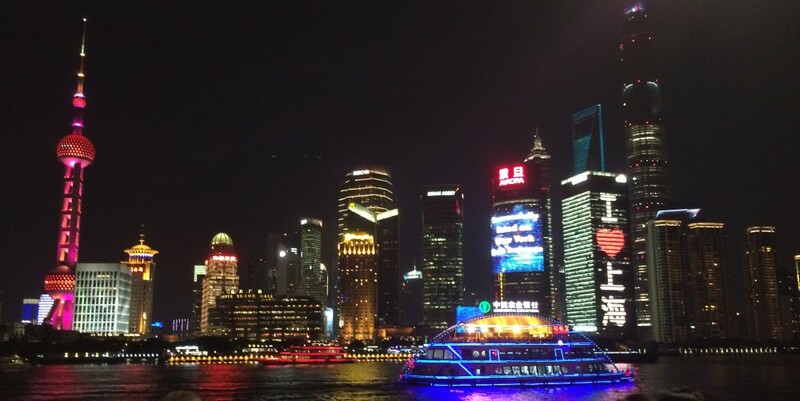 I finally, with the help of Google translate, had to use the parenty-sounding, “What!? Do you think I’m made of money?” right before I gave him $10 dollars for some more hibiscus. Damn kids. 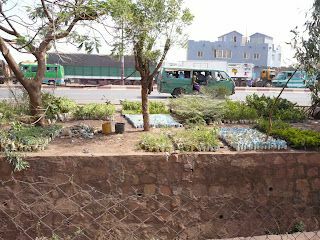 This entry was posted in Bamako, international schools, Mali, travel, Uncategorized and tagged Africa, Bamako, education, gardens, international school, Mali, teaching, travel, urban gardens, West Africa by 2seetheglobe. Bookmark the permalink.